Later than last year but right before show season starts next week, let us have a look at this year’s goals. 10. Keep the level of ambitiousness. 9. Make training as diversified as possible. 8. Work more with poles and ricks. 7. Develop a good working canter. 6. Improve my core muscles. 5. Work on counter canter and simple changes. 4. Go to a horse show in a foreign country. 3. Achieve a proper second level performance. 2. Finish the necessary points for the next license. 1. Go for next show level at the end of the season. And in the half year review, we had added already some goals and also achieved most of them (http://www.dressagehafl.com/2014/08/h12014-results-and-outlook.html). 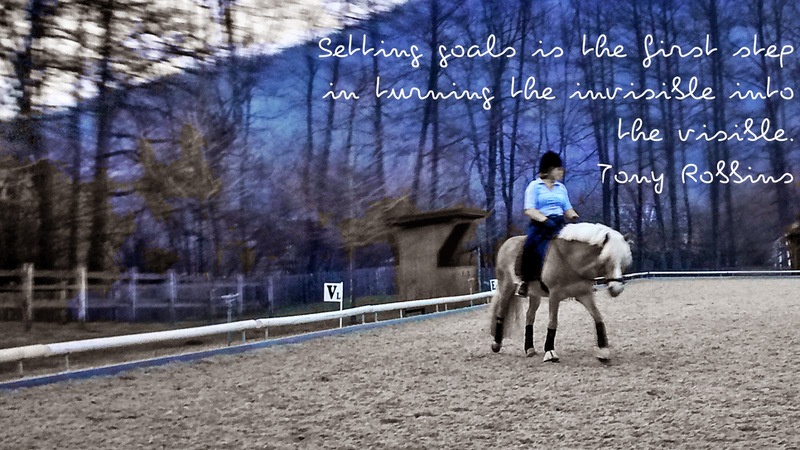 Looking back, most of the 2014 goals were all achieved (http://www.dressagehafl.com/2014/12/looking-back-goal-review-2014.html). This leads us to the question: do we need higher goals in order to be challenged? What is definitely true is that our aim has changed. In the last couple of seasons we were hunting ribbons, blankets, rankings and competitors. While this is good for setting a goal above average, this is not that easy anymore when you are trying to move up levels. As you might know, we will enter LM class this year, which is between 2nd and 3rd level. For the next license, that allows us to enter 3rd level, we need 4 LM results above 62% and 4 LP results above 62% (LP also an in between level that already requires flying changes). Last year, we got the first out of 4 points in LM, consequently, we need to come up with 3 more this season. So let us set this as goal number 10. 10. Gain further 3 LM results above 62%. 9. Achieve (in total) 4x 58% or more in the Alps Adriatic Dressage Trophy Qualifier. Two results are needed to go to Lipica, Slovenia, 4 results are necessary for going to the finals. Speaking of freestyles. After a year of no choreography and music editing, this year we will be back on show stage. Later, in August, we will participate in a costume freestyle at LM level. I have ideas about that already but I cannot tell you otherwise where would be the surprise?! Choreography and music is a lot of work so we already now need to make up our mind. A bit earlier than the freestyle, we have the regional Haflinger Championships again. I will participate as well (can tell that for sure as there are no qualifiers). In August, there will be the Austrian Haflinger Championships which only take place biannually. Participating in the regionals and some other criteria might allow us to go there this time, so let us set that as goal, too. Remember last year we also took part in some trophies and cups, we will also participate this year in the Styrian Dressurtour. This year, we need to have 8 results in LM/LP to be able to make it into the ranking. This amount of results determines the entries in Styria this year and thus has a big influence on our show planning. To make it into the money ranks, we need to be among the Top 20. Speaking of rankings: as we worked on a costant improvement of our Austrian dressage ranking, we will keep that hard work up this year as well. 4. Improvement in the Austrian Dressage Ranking. In order to improve, we now have an agreement for regular training plus we will also participate in some clinics. The first one will be double lunging in April. Further, all the new training approaches (like for example the Happy Horse Training Audio Ride:http://www.dressagehafl.com/2015/03/happy-horse-training-audioride-first.html )will be a significant part of our training. This year, I also aim to have a better training planning for Hafl including lunging, cavaletti work, double lunge, in hand work… One clinic we already attended in February. All this should also help us to reach one of our top goals this year, start the work on the flying changes. That includes basic work like improvement of the collected canter and such. 2. Work on the next level movements.